We begin with a stock of cores that covers nearly every type of transmission manufactured, and then employ a specialized remanufacturing process that provides a finished product that often meets or exceeds the factory specifications. 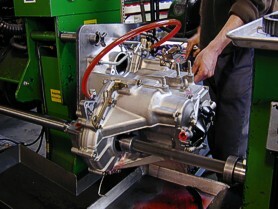 Each rebuilt transmission is completely disassembled and thoroughly cleaned. Then each component is evaluated for wear and damage. Any hard parts that don’t meet the necessary tolerances are repaired or replaced, and all soft parts are replaced. The torque converter is matched in house. Finally the transmission is painted, dyno-tested, and delivered in shipping friendly packaging. If there are components that should be upgraded to improve or eliminate engineering deficiencies from the manufacturer, they are installed. The unit is then carefully reassembled. Each completed automatic transmission is tested on our Axiline dynamometer. This piece of equipment thoroughly evaluates the performance of the rebuilt transmission by simulating operating conditions, much as if it were installed in the vehicle for which it is intended. Any final calibrations or adjustments are made at this point in the process. The remanufacturing takes place in a precision, assembly-line process that delivers a high-quality finished product at a lower cost, making these transmissions the best value in the industry. You’ll find wholesale rebuilt transmissions from TRC are consistently top-quality, and very competitively priced. 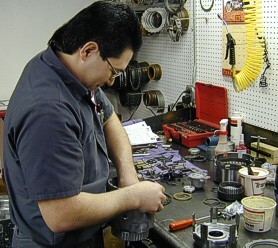 • Tour our facility, see our systemized process for rebuilding transmissions.